A man at the centre of riots in south London last August has had three years added to his jail sentence. Adam Khan Ahmadzai, 20, of Feltham, west London, was jailed for 48 months in January for violent disorder, robbery, burglary and criminal damage. The Attorney General Dominic Grieve said the sentence was not tough enough and referred it to the Court of Appeal. Lord Chief Justice Lord Judge, Mr Justice Openshaw and Mr Justice Irwin agreed, increasing it to seven years. "These were offences of great seriousness," said Lord Judge. 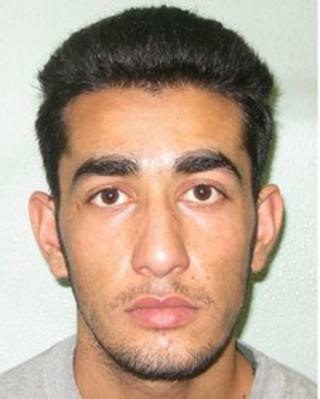 The attorney general said Ahmadzai was at the "very heart of the looting and rioting" in Croydon on 8 August 2011. He said Ahmadzai led an attack on a police line, robbed a bus driver and, after arming himself, robbed owners of a shop after they were forced to flee. The court also heard that Ahmadzai repeatedly attacked and mugged a terrified man at a cash machine where he was acting as if to push a gun into the victim's neck. He led a gang into a supermarket which he then looted and vandalised before looting a betting shop. CPS London chief crown prosecutor Alison Saunders said she welcomed the "strong message" that the Court of Appeal had now sent out. She said: "Adam Khan Ahmadzai was a ringleader during the riots in Croydon and his conviction for 10 offences committed that night shows the extent of his criminality. "His offences were amongst the most serious which CPS London has prosecuted in relation to the summer riots and this increased sentence reflects that." Ahmadzai, who used a brick, a wooden and a metal pole, a hammer and a waste bin as weapons, had pleaded guilty after he was seen on CCTV footage and his blood was found on the cash machine.